Home / Blog / Victory – City of Glendale responds to our petition! CSR #41486 has been COMPLETED. Thank you for contacting the City of Glendale. Your Customer Service Request has been closed by our staff. Please read their comments, below, and then let us know how we did by taking a moment to fill out a brief survey regarding this request. 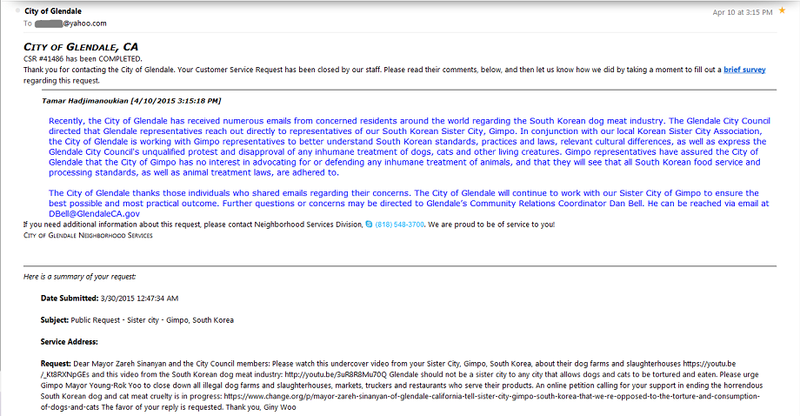 Recently, the City of Glendale has received numerous emails from concerned residents around the world regarding the South Korean dog meat industry. The Glendale City Council directed that Glendale representatives reach out directly to representatives of our South Korean Sister City, Gimpo. In conjunction with our local Korean Sister City Association, the City of Glendale is working with Gimpo representatives to better understand South Korean standards, practices and laws, relevant cultural differences, as well as express the Glendale City Council’s unqualified protest and disapproval of any inhumane treatment of dogs, cats and other living creatures. Gimpo representatives have assured the City of Glendale that the City of Gimpo has no interest in advocating for or defending any inhumane treatment of animals, and that they will see that all South Korean food service and processing standards, as well as animal treatment laws, are adhered to. If you need additional information about this request, please contact Neighborhood Services Division, (818) 548-3700. We are proud to be of service to you! We would like to thank Mayor Zareh Sinanyan and the City of Glendale for not ignoring our petition and for following up with an action for resolution. We respect the City of Glendale’s diligence and empathy for addressing this issue in a timely manner and for informing us on the progress of their effort with honesty. Currently we have more than seven campaigns going on urging the sister cities and states of South Korea’s major dog meat markets to help close down the illegal dog meat industries in their sister cities and states. I am sure many of you have signed the petitions, sent emails and called these cities and states. However, so far, the City of Glendale is the only one who has responded to our request. This is a big encouragement for us to continue our fight to speak out for the horribly abused dogs in the South Korean dog meat trade. I look forward to receiving more positive responses from the other sister cities and states of South Korea that we are working on. Although “Gimpo representatives have assured the City of Glendale that the City of Gimpo has no interest in advocating for or defending any inhumane treatment of animals, and that they will see that all South Korean food service and processing standards, as well as animal treatment laws, are adhered to”, this is only a lip service until we can see an action that follows their words. Therefore, we will keep our Gimpo-Glendale Sister Cities Campaign and Petition open until we can witness a concrete effort by the City of Gimpo to crack down on the shameful dog meat farms, slaughterhouses and markets operating in their city. We hope that the City of Glendale will continue its great effort to keep the pressure on Gimpo to deliver on their promise. Please feel free to send a thank you email to the City of Glendale. What we do makes a difference. So keep taking actions to speak out for the Korean dogs who cannot speak out for themselves. Click HERE to take actions today! Thank you!